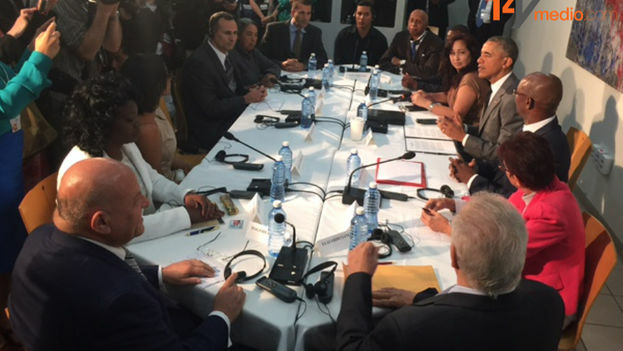 EFE (14ymedio), Havana, 22 March 2016 – Several dissidents who met with President Barack Obama in Havana this Tuesday, assessed the meeting as “positive” and “frank,” and one of them delivered a list of 89 political prisoners recorded by the group he leads. Sanchez explained that during the dialogue with the US president, he handed him a copy of the list of 89 political prisoners prepared by his group, the only one that undertakes an ongoing documentation of these cases in Cuba. For veteran government opponent, the balance of Obama’s visit to the island was “favorable to the cause of bilateral democracy” but he lamented that far from encouraging an “atmosphere of calm” the Cuban government unleashed “a wave of political repression” which, according to the records of his group translates to between 450 and 500 arrests across the island between Saturday and today. For his part, the former political prisoner of the 2003 Black Spring “Group of 75,” Jose Daniel Ferrer, one of the thirteen government opponents invited to the meeting, described as “very positive” the meeting because “it was a show of solidarity with those of us who are fighting for the reconstruction of the nation. “We talked about the process initiated with the Cuban government to normalize bilateral relations, also about his visit, and we also had the opportunity to make suggestions and give opinions on issues that we believe should continue to be pursued and what should not be done in this case,” said Ferrer, leader of the Patriotic Union of Cuba (UNPACU). Miriam Leiva, also invited to the event, considered it “very open” because the president listened to the participants who “could express their views on the current situation of repression and human rights in Cuba” and also he made comments. “There were some who raised positions contrary to the policies of President Obama, but in the end he expounded on his views about what he is doing and what he can do to benefit the Cuban people,” said the independent journalist. In her opinion, the fact that Barack Obama set aside a space in his busy schedule of about 48 hours in Havana for this meeting at the US embassy, ​​represented “recognition and support” for the Cuban opposition. Rodiles, critical of the new US approach to Cuba, said he told Obama his doubts about the process of normalization of relations and the “enormous level of violence and repression” in recent times. Also at the meeting dissidents and activists such as the leader of the Ladies in White, Berta Soler; Guillermo Fariñas; Manuel Cuesta Morua, of the Progressive Arc; and the critical intellectual Dagoberto Valdes. In brief remarks to reporters about the meeting, Obama said that one of the objectives of the normalization begun with Cuba is to be able to “hear directly” from the Cuban people and ensure that they also “have a voice” in the new stage initiated between the two countries fifteen months ago. Note: Cuban dissidents, independent journalists and human rights activists present at the meeting were: Angel Yunier Remon, Antonio Rodiles, Juana Mora Cedeno, Jose Daniel Ferrer, Laritza Diversent, Berta Soler, Dagoberto Valdes Hernandez, Guillermo Fariñas, Nelson Alvarez Matute, Miriam Celaya Gonzales, Manuel Cuesta Morua, Miriam Leiva Viamonte, Elizardo Sanchez.